Although it was believed Alistair Overeem (Pictured) would retain his heavyweight top contender moniker once his nine-month drug suspension was lifted, the Las Vegas Review-Journal is reporting the former Strikeforce champion make his return against Antonio “Bigfoot” Silva at UFC 156. The UFC essentially confirmed the scrap by retweeting the LVRJ’s post. Of course, Overeem must first wait until December 27th to reapply for licensing after registering more than twice the legal limit of testosterone in his system this past March. The Nevada State Athletic Commission is expected to hold a meeting in early-to-mid January. 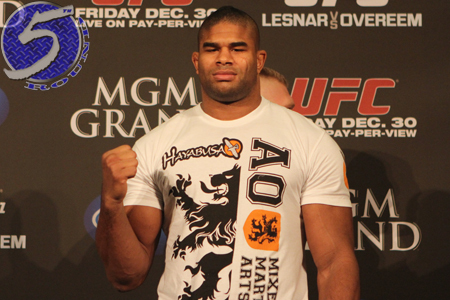 Overeem’s lone big league performance came last New Year’s Eve weekend in a TKO victory over Brock Lesnar. He was set to challenge reigning champ Junior dos Santos for his hardware at UFC 146 until flunking his pre-fight drug exam. “The Demolition Man” has been riding the pine ever since. Silva, meanwhile, handed Travis Browne his first professional blemish in his most recent outing. The TKO win snapped the Brazilian’s two-fight losing skid. Mandalay Bay Events Center in Las Vegas, Nevada hosts the February 2nd festivities.